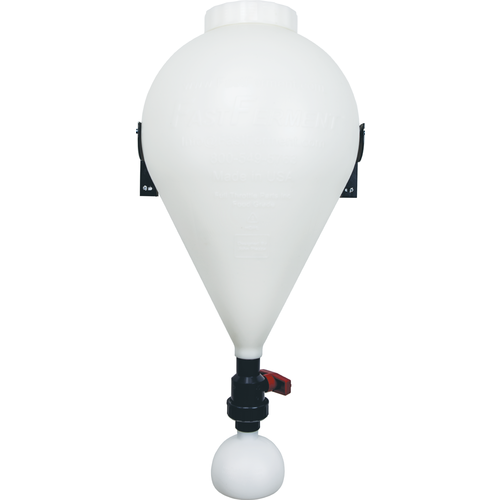 The FastFerment is an affordable conical fermenter that allows a brewer or winemaker to collect sediment in the included collection ball for easy removal. Easy to use and more affordable than stainless steel conicals. During fermentation the bottom valve of the FastFerment is left open so that sediment will fall into the collection ball. After fermentation is over the valve is shut and the collection ball can be removed without introducing oxygen into the FastFerment. Typically with most small conical fermenters if you let trub dump out the bottom air has to come into to replace that volume. After dumping sediment or trub the collection ball can be reattached and the valve opened again to allow clean yeast to settle into the ball. That yeast can then be used to ferment your next batch of beer. If you are a brewer who likes to do a primary and secondary fermenter having a conical that allows you to avoid that transfer is going to save time and reduce oxidation. Made from HDPE plastic care should be taken when cleaning. Only use a chemical cleaner like PBW and do not use an abrasive cleaning pad that could scratch the interior. To have control of the yeast trub during the fermentation process. With all the available add-ons, this unit is a real pleasure to brew with. The trub collector really lends to a smooth result & eliminates the need for a secondary fermenter transfer! Just all the way around a perfect system for any beginner in the home brewing game. Best plastic conical! Great customer service.l! Not only is this a great product, the customer service is wonderful. I purchased this conical fermenter and about a year in the ball valve was malfunctioning. I emailed the company directly and within a week I had a brand new ball valve kit on my doorstep! So awesome! I highly recommend this for an inexpensive east to use fermenter. Love my fast ferment 7.9 gal conical fermenter! Great fermenter, a real time saver, with out the mass of transfers. Thanks!!! It is working very well for me! Just completed my first brew on this system! It is bottle aging now, but the process of getting it from ingredients to fermenter, from fermenter to bottles was "a hell of a lot easier"! yeast activity I have ever had! I spent 2 weeks giving this unit a good shake down as the manufacture suggests testing for leaks. (Honestly, I was nervous about trying it!) This is the cost trade off! Labor to make a careful product inspection & test against the impulse to just "go for it!" On my own, I darkened the measuring lines on the outside so they contrast against the body to make them more easily readable. I installed the sampling port & it drips through the spigot about 1 drop every 5-6 hours. A keg lube fix! The stand, thermometer & carry strap are perfect. The thermal jacket is not easy to install using the stand. Going to rest mine in a potted plant stand so I can move it between the kitchen & cellar. I will have more room to install / remove the thermal jacket in the kitchen. I hope the next 200 brews off this are as good as the first! Every single batch I've made using this has ended up clogged when it's been time to keg. I've had two bad batches as well and that hasn't happened since I first started brewing several years ago. Went back to my Speidel and the beer's coming out normal again. Less than impressed for what I was hoping this would be able to do and cut down upon (primary and a secondary). Amazing product. Really enjoy using it. Easy to clean and use. Great wife kid at top easy for dry hop additions and cleaning. I prefer to use the stand over hanging on wall, though both options are great. I found that the Fast Ferment did the basic function of providing the utensil for fermentation, but several issues keep it from getting a high mark. First it was impossible for me to get it airtight so that I could actually see the airlock working. You could tell that it was fermenting and the airlock was partially pressurized, but never a bubble actually escaped. I tried additional plumbers tape but still couldn't get it airtight. Secondly, the valve to open and close the trub ball at the bottom got totally stuck and I was afraid to break it using a wrench. So I ended up manually siphoning out the beer and leaving the trub behind as best I could. After soaking it in hot water, I was able to turn it again, but essentially it was useless. This fermenter work well so far but the plastic threads are a real concern for me. Nice heavy material. You can't push it in. Worked fine without any leaks. Cone shape worked the trub down into the collection ball as promised. Molded insert for a thermometer. Liquid measure marks molded right into the vessel. Nice big opening for easy cleaning. Opaque white. Can't view your brew. Plastic threads. I'm sure these will wear out or strip out in time. The fittings seem less quality than my other fermenter. Assembly is a bit cumbersome and time consuming due to having to "break in" all of the threads and having to vinyl tape "everything" . Doesn't come with the stand or a carrying strap. Will cost you an extra $65.00 to outfit this unit. Why buy one when you can buy two for twice the price? Yes, there was a little leaking for the first brew. BUT, with a little keg lube around the lid, and after I made sure all pieces are threaded properly, then there were no leaks. I bought the tasting port for each fermenter, too, so that I can now check gravity with minimal risk of adding extra oxygen. After primary fermentation, I unscrew off the collection ball and harvest the yeast for my next brew. I've made 11 brews now using these. Going to buy a 3rd soon! I have two and looking at getting a third! I couldn't be happier. Yes, I did notice leaks at first, but after using a touch of keg lube on the lid and making sure the other parts are threaded correctly, it was air-tight and no leaks. I followed those procedures when I bought my second one and all is great. I'll probably be buying a third very soon. Two complaints: 1) The first is the height of the stand. I would want it a few inches higher to better accommodate working with the collection ball and using tubing there. This isn't that big of a deal. 2) The fastferment thermometer accessory (sold separately) can't be calibrated, is 6 degrees off currently, and I'm not sure how well it works anyway. To be honest, because I am using a plastic fermenter and since I don't have the money to go bigger with stainless steel, there's not much I can do about temperature other than watch it and be anxious anyway. This product is wonderful...Saves time by eliminating racking and the hassles associated with it. I do recommend purchasing or making your own stand, helps with cleaning and storing if you don't want to leave it attached to the wall. This is a great idea and very convenient fermenter until it starts falling apart because EVERYTHING on this thing is plastic, cheap plastic. After 3 brews, the 1" part on the bottom where you mount the valve broke so it basically became useless - I had to throw it away since there is nothing I can do. I would definitely spend the extra $$ and get a stainless steel fermenter since it will not break when you are taking it apart and cleaning to sanitize. Doing the math, it basically cost me $40/batch to use this thing. If you absolutely want to go cheap, get the speidel fermenter for $50. I LIKE this fermenter. I've lusted after a conical, but couldn't afford one. The price on this made it a "no brainer." Yes, there are compromises at this price point. The threads on the fermenter itself could be much better. With lots of teflon tape I got the shut-off valve attached with no leaks, but it was very easy to cross thread. More of an issue is the top because you install and remove it each time. On my first batch the gasket came loose (I found it floating in the beer!) and so the top didn't seal. Not a big deal except the air lock didn't bubble so I couldn't tell when it stopped fermenting. After that, I glued the gasket to the top with a bit of silicone cement. I'm still not sure it is sealing 100% as the rate of bubbling doesn't match what I am used to seeing. It is also very easy to get the top on crooked which of course won't seal at all. On the plus side, using it is a joy. Fill it up, pitch the yeast and hang it on the wall. When primary fermentation is done, remove the ball and dump or re-use yeast, reattach and - bingo you are in secondary fermentation - add dry hops through the top if desired. When secondary is done, dump ball again and attach hose to keg or bottle. (Add priming sugar if needed.) ALL IN ONE CONTAINER WITH NO RACKING! I can't tell you how much easier this makes things! I would opt for the sampling port to check SG as you go along as getting it out the bottom or top is difficult. Other than that, it is a very good product and for the price it can't be beat. Better threads would make it a 5 star. I have had the FastFerment for about 2 years now and have to say it can't get much easier. The set up of this unit is very easy and straight forward. 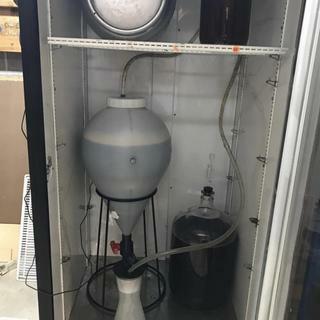 I was confused at first how to handle the collection ball removal and replacement without introducing oxygen back into the fermenter, and through research I found either filling the ball with Co2, removing wort from the unit and filling the ball or use distilled water to fill the ball. After trying all three I found the use of distilled water was the easiest and didn't effect any of the the beers characteristics.I have now sent over 20 batches thru this unit with great results. I place the wort in the fermenter for about 1 week, remove the collection ball clean the trub and replace the ball filled with distilled water. 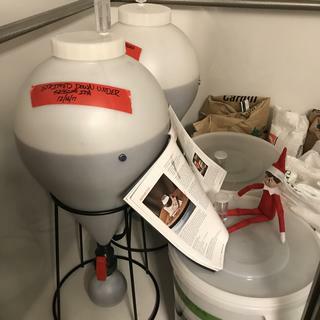 Then secondary fermentation and dry hop additions, let set for your specific time, remove the ball again, which will have collected additional trub and yeast and then its ready to keg or bottle. The beer comes out much cleaner and clearer than you will find using a bucket or even a Speidel (I have 2 so I know). I highly recommend this unit you will not be disappointed. With the exception of DIY with plastic inductor tanks, you'd be hard pressed to find a conical this cheap and containing all the parts one needs to successfully ferment beer. Assembly is straight forward and my plans are to largely build a portable stand out of 2x4s in addition to hanging the wall mount. I'm knocking it to four stars for two primary reasons that could largely be improved upon in the future--1) Plastic flashing. The threads on both the top lid and bottom have plastic flashing (lines) from where the two pieces were sealed together. Perhaps improving QC or altering the process to remove this extra plastic would allow for a better seal without the potential for cross threading. 2) Bottom exit to capture vessel. I would love to see a larger bottom... something around 1.25-2" would be awesome. In addition (and merely a potential upgrade) would be to allow the attachment of a mason jar. When you start pricing out potentially two carboys and transfer equipment, it does seem practical to have a one-and-done-approach. I received my FastFerment about three weeks ago. I strongly recommend a leak test with water prior to brewing as I initially had a leak issue with the thermowell, but a few more wraps of the Teflon tape cured that. That could have been a disaster if I hadn't discovered it with water. I currently have my first batch just about ready to keg, the only issue I had was that I didn't get a solid seal on the screw on lid. However, since I intend to keg in a few days, I don't think that is an problem. I chose to use a blow off tube instead of an airlock for the primary and switched to the airlock for the secondary. During the primary I noticed that I wasn't getting any blow off through the blow off tube, tightening the lid a bit more seems to have cured that issue. I plan to do a pressure check of sorts with low pressure CO2 to verify that I know how tight to tighten the lid in the future. the only other minor issue is something that I don't think you can avoid with any conical. I'm used to being able to see when my primary ferment finishes, you get a visual "sense" of what is going on in the fermenter, but not the view in a glass carboy. Something I can easily live with. Remove the trub was a breeze. No more sanitizing, racking to go from primary to secondary. Just close the valve, pull off the collection ball, clean it out, sanitize and if you have it, "fill" it with CO2. At first I was concerned that water would draw from the blowoff/airlock when I replaced the ball, but after putting some thought into it I realized that physics would and did prevail. The volume wasn't changing, just liquid was being replaced by air/CO2. So far, for a 5 gallon batch, I've drained the ball once. The sediment level in the ball is currently about halfway. I plan to pull it again, then give another week for the beer to clarify then keg. So far a painless process, and apparently good results. I tend to brew two batches at a time so I see a second FastFerment in my near future, all in all a great product for the price. I'm happy with this product. This is my second FastFermenter. I look forward to more ingenious inventions by this company! An amazing evolution from the glass carboys, love the price, love the easy setup and cleaning. Seriously have nothing but good things to say about this system. Glad we found it and look forwawrd to more fastbrewing products! Overall this fermenter seems to be well made. All the pieces feel like decent quality, and they screw together nicely. The one exception is the screw top lid. As per what other reviewers have commented, it's very tough indeed to get a seal. The rim of the fermenter is highly uneven, and I had to file it down to achieve a flat surface on which the silicone seal ring could sit. Even when I got it pretty flat, I still could not get a seal (when held upside down, liquid poured out the sides of the lid. Fortunately, I also bought a brew jacket which came with another lid, and a different seal ring. If felt kind of flimsy and papery, but it actually did the trick and got me a seal. So, I'm pretty shocked that this company is letting itself down with this shoddy finishing, and I'm going to have to figure out a longer term solution for this issue. On balance, I think I would still buy this fermenter as it's very good otherwise, and hey, it's not that expensive. But this feedback seems pretty common, so they should try to fix it ASAP. This item alone will make my beer taste even better because of the way this item will handle my primary and even secondaries. I saw their stand at the National Homebrew Con and fell in love! I was on the fence about buying this due to the mixed reviews, however, I noticed that on amazon, a lot of the negative comments had replies directly from FastFerment. This, along with amazons return policy and free shipping convinced me to take the chance, and I was not disappointed. The Fast Fermenter is much easier to clean than my carboys and saves me a lot of time by not having to transfer to secondary. One of the main issues that people seemed to have was that when you replace the collection ball, you are allowing air/oxygen into the system. While this is true, I have never noticed any off flavors or oxidation in any of the three batches I've made. Also, I would have to guess that this is less than the amount of air that is exposed to the beer when transferring between two carboys. The second issue that concerned me was the trub getting caught and not making it into the ball. I can see how this could become an issue if you do not filter the wort before you place it into the fermenter. I always filter to help aerate, and to make cleaning easier, so this was not an issue for me. I also liked the idea of using the collection ball to capture and reuse yeast, however I have not tried this yet. Some people have mentioned that the lid does not seal tightly. I didn't seem to have an issue with that or the oring. I'm interested to try this out for making wine next. This is an inexpensive conical and priced appropriately. There is room for improvement in the design but I really like what I got. The sediment separation is great. I don't have any leaks and I only go hand-tight with teflon tape on the fittings(tape is key). I did drop the lid gasket into the unit the first time. Now it's siliconed to the lid. The biggest problem I face is that I mounted the brackets high up and I can't transfer into it easily(no pump yet) so I had to fashion a stand, and it isn't easy to lift and carry without a harness of some sort. So for wall mounted units, a stand and carrying strap become necessary. It would be nice if the thermowell was rotomolded(?) into the unit to make cleaning faster and easier. I'm going to run a few more batches and then buy a second. Additionally, it really cleans up my home-brewery making it more functional, more efficient and more fun. Thermowell leaks. I have tried everything but nothing has stopped it. Returning ASAP. This will not replace a pro-grade conical fermenter, but it's a great entry-level fermenter that does its job well considering the price point. Better lid gaskets are available from other retailers that help with the issue mentioned in other reviews. If the threads are carefully sealed with teflon tape, leaks are a non-issue. Racking is a thing of the past, and I couldn't be more pleased by that! Great fermenter for the price. I've used this for 3 batches so far. It makes doing multiple fermentations very easy. Just empty the collection ball and you're on a secondary or tertiary, no transferring at all. Additionally, kegging is a snap. Attach the provides transfer adapter and hose, open the valve and drain it straight to the keg. Much cleaner and faster than a syphon! My only complaints so far is the difficulty of getting a water tight seal. I often get some small slow leaks, even when using the provided Teflon tape on all of the threads. Part of the problem is difficulty with gripping the various pieces to thread them tightly enough. It might be better to have some tabs on each item (i.e., the lid, the collection ball adapter, etc.) to provide a better grip and torque. Despite the other reviews which are mixed, this is an awesome product. 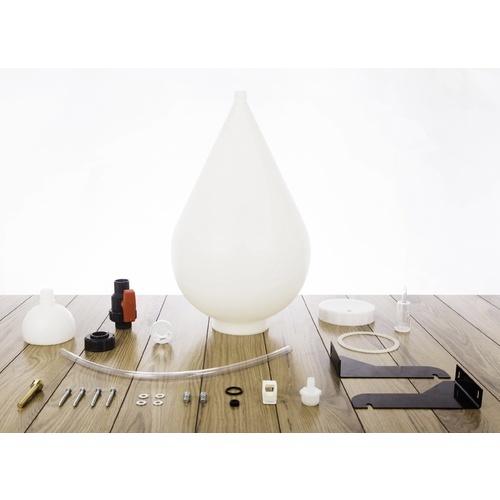 If you're looking for an economical conical fermenter. this is the thing. Simply be very careful with the pipe tape and making sure all the joints are set up so that they do not leak. If you do this, this thing will cause you to never want to use carboys again. I highly recommend this product. This conical works for what it is. It's cheap. The bottom trap doesn't seal well. I have to use channel lock pliers to get the fitting tight enough to stop leaks. The lid gasket likes to slip and if you aren't careful you won't get a good seal. It's still better than racking between car boys but only slightly better. I really suggest you save up and get a proper conical. I've brewed with this fermenter a few times now. It's hard to beat for the price. I've read a lot of not so great reviews of the product and I find myself at odds with many of them. I've found it to work great, easy to clean and use. I love that I've been able to remove a lot of my normal tools lowering the risk of contamination (no more funnel, transferring carboys or racking cane). It has downsides, most certainly, I don't like that all the threads are plastic as they're easy to cross thread. I can understand it with the threads directly on the body itself, metal threads on the body would have a seam and potential for bacteria to grow, but all the accessories are plastic too. I also find that sometimes when I go to remove the collection ball, which is definitely a bit messy, I sometimes loosen the whole valve instead of just the ball, so it requires two hands, one to hold the valve in place and one to actually remove the ball. If the valve locked into place this could be done with one hand. Instead of buying the stand I went to Home Depot and purchased one of those planter stands. I cut out the metal cross pieces leaving just the circle at the top and the FastFerment fits great in it. The one I picked also has cross pieces on the legs so they're still sturdy. As an added bonus, I use the drip tray that came with the stand to put under the fermenter, especially when changing the balls, to catch the beer that drips out. It's not a ton, but the ball is definitely filled all the way to the brim, so not spilling is nearly impossible. If the ball recessed into the valve a half inch or so I think this could have been avoided. I only use this when I'm filling it out of the kettle, at all other times it's wall mounted. Is it perfect? No. But I love it and I'm looking forward to buying more and adding the sample port. As my first conical, I'm happy I moved away from carboys. I have a few issues with the Fast Ferment, though. First is that the thermowell is a terrible design. The threaded area into the fermenter is recessed in such a way that it is IMPOSSIBLE to clean without removing the brass thermowell, cleaning, retaping with Teflon tape, then rescrewing it in. Second is that the lid doesn't create a seal unless it is very very tight. When it's finally tight enough to get the seal, it's difficult to get a good enough grip to open (and I have pretty large hands). Fourth is the yeast trap. It's extremely messy to remove the trap. Beer goes all over the place, all while I'm trying to cover it to prevent contamination. Finally, the unit appears to be two halves melted together. This creates a small indent on the inside which is difficult to clean. I love the idea of a (relatively) inexpensive conical, but this one is just too poorly made to make me recommend it. I wouldn't buy another one.